Not long before lock up—9:00pm—on the fifteenth October 1974, we in Compound 11 became aware of a bit of a ruckus in Compound 13. Less than two hundred yards away, we were able to see what looked like a number of Republican prisoners attacking a small number of screws. The screws ran—for their lives—and managed to get out through the double gates to safety. It transpired that there had been a minor misdemeanour and the screws were there to take an IRA prisoner out to the punishment cells. The screws who had been attacked passed 11—along with their fellow guards—en route to the Silver City—a purpose built prefabricated headquarters. One of the screws—who hailed form Killyleagh—was bleeding from a head wound. He told some of the guys in 11 he had been brutally attacked and that they-the screws-were getting offside and allowing the Army to take over their duties. Rumours abounded about what might happen next. What in fact did happen was that the estimated 1500 Republican prisoners ran amok—carrying through on a pre planned determination to burn Long Kesh to the ground. As usual we were locked up just before nine and by then it was obvious that something “big” was going to happen. As soon as the last padlock was fastened the screws on our compound made themselves scarce. We in the middle hut-all UVF/RHC-convened immediately and under the tutelage and command of John McKeague made hasty plans. We were thinking worst case scenario. An attack from the Republican hordes where-throughout the jail-Loyalists at best numbered something short of 300-the outcome didn’t bear thinking about. There were perhaps twenty odd of us in the middle hut at that time and we armed ourselves as best we could..bed ends..weight lifting bars—table legs and went as far as making sure the Burco was filled with boiling water. The position of our hut in 11 meant we had a very limited view of anywhere so didn’t see the first glow of fires from the bottom phase. However, it wasn’t long before the smell of burning reached us. Almost at the same time we had a visitor to one of our hut windows. Fergie Robb was a Red Hand Commando serving an 8 year sentence. He was a resident of Compound 19..Gusty’s compound..in effect-Headquarters. Fergie was one of those who had been tasked with relaying the news to us Loyalists in Phase 5..apart from us in 11 there were remands in 9..other sentenced men in 12 and of course the internees/detainees in 14. To reach Phase 5 from Phase 6 was a commendable feat on its own and required Fergie to scale many fences to reach us. He appeared at the window and told us..”They’re burning the camp”. Fergie disappeared again-back to Headquarters no doubt. Almost immediately we made our own plans to break out of the hut. Some of the bigger guys utilised a sit up bench and set to work on the inner doors. No sooner had they started when we heard noises outside. On looking out the window we discovered that a horde of republican prisoners had already broken into our compound by busting the locks on the gates and were now outside our hut. I estimate there was around thirty to forty of them-all armed with weapons of some description. To say that we were fearful of our lives at this stage is something of an understatement. Amidst a commentary from one of the gang leaders about how the camp was about to be destroyed, they were also breaking open the outer sets of doors to our huts. McKeague went to the window. It transpired that the leader of the mob was the well known IRA man, Cleeky Clarke. In an exchange McKeague informed Cleeky that if they tried to enter our hut we were waiting for them and would fight. Cleeky replied that they intended us no harm but it was in our best interests to vacate the compound as the Army wouldn’t be asking question when they inevitable arrived. He also gave assurances—presumably on behalf of the IRA that no Loyalist compounds would be touched. They were only burning their own compounds he said. At that the mob disappeared. We came out of the hut to find absolute pandemonium. 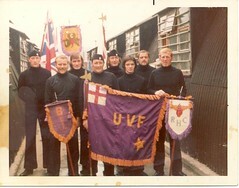 The rest of the UVF/RHC personnel from the other huts grouped together out front. Facing 11 was the visits and beside that was a section that housed welfare huts and the Tuck Shop. We could clearly see that the shop had been broken into and was in the process of being looted but at that stage it wasn’t alight. It was later to be burned but it later transpired that the looters were the Ordinary Prisoners who had broken out of Compound 15. On McKeague’s orders we left the cage and moved to a spot in between there and the next compound-12. Our colleagues who were still there were in the process of coming to join us. So too were the remand prisoners who had made their way to us from 9—two compounds away. As if by some form of telepathy the UDA prisoners all merged together, as did we. McKeague assumed overall command of our grouping and the first orders were that we must all stick together..at this stage we were unsure of how things were going to pan out and as each moment passed more and more IRA men were arriving from the bottom phase. Most carried weapons and a lot of them had blankets draped across their shoulders-poncho like. Some were also masked up. The tension was high. Within our own ranks we had guys voicing the opinion that perhaps we should go on the attack against the Republicans before the inevitable happened to us. The decision was taken for us all to move en bloc to the internee’s cage-14. We gave no thoughts of trying to take belongings with us as we were under the apprehension that no Loyalist compounds would be ransacked or burned. How naive would that turn out to be? As we moved towards 14-only a couple of hundred yards away across one of the football pitches I was very aware of the groups of Republicans—huddled together-staring at us and looking menacing. Whilst not in military formation we at least were grouped closely together and moved as one. We negotiated our way to 14. The gates were open and the cage was teeming with activity. Already there were people on hand offering cups of tea and seats for the older volunteers. In our ranks was one old gentleman-Mr. Thompson who had just been sentenced a couple of weeks previously. He had received 8 years for manufacturing machine guns and was a “non-aligned prisoner”. He was around 70 years old and quite frail. In fact he transferred a short time after the fire and completed his sentence in Crumlin Road. We were left to mingle with the internees and everyone else who turned up to 14-including YP’s. I think the theory foremost in everyone’s mind was that safety in numbers was the best option. 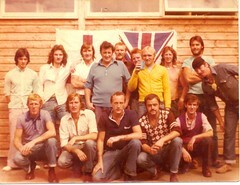 Many of the Nationalist YP’s of course joined the ranks of IRA men. An interesting note here is that quite a few of the YP’s were Loyalists—many in the organisations but who were serving short sentences for riotous or disorderly behaviour charges. It was they who had ransacked the Tuck Shop and here they handed over their ill gotten gains—tobacco-papers-confectionery-and drinks etc:. Rumours abounded and changed every few moments. The atmosphere was electric and the general feeling was that it would all end in tears..for some. It was obvious that the Republicans were intent on burning as much of the jail as possible. We could see stores and outbuildings and by now unmanned watch towers leap into flames. A memory I will always recall from that evening is of a number of the watch towers glowing red-the corrugated iron sides-before explosions ripped through them blowing them apart—this was the Kosangas cylinders igniting—they were used in winter for Supersers. After an hour or so number of us..mostly RHC prisoners were instructed to form a party to go back to Compound 11 with the instruction to salvage as much stuff as possible. We aimed to put it into blankets and between us carry it back to 14. By the time we got out on to the pitch which gave us access to the next phase we could already see smoke and some flames coming from 11. We traversed the compound and entered through the broken front gates. As soon as we entered it was obvious that there would be very little to salvage. The huts had been totally vandalised-lockers and beds strewn all over the huts—piles of belongings in the middle of the floors—and they had also been set alight. So the promises made by senior Republicans to spare the Loyalist compounds had been reneged on within an hour. We trooped back to 14 to report. 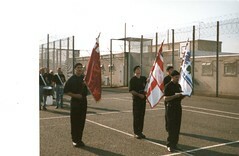 There were a number of prisoners from 19 who had turned up. There were senior staff officers who were there for a pow-wow but there was also a couple of “runners”—who flew about the jail most of the night relaying information back and forward. The two I remember were Fergie Robb and Stevie McCrea. Myself and three others were called to the side by a senior internee and John McKeague. 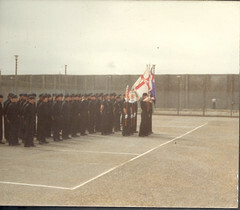 A Loyalist internee was a patient in the prison hospital –recuperating after experiencing a heart attack and the four of us had been tasked to go and bring him safely back to 14. My memories of the night are, I suppose fuelled by the adrenaline and excitement. Despite only having a checked shirt, Wrangler jacket, jeans and DM boots, I cannot recall feeling the cold. The other 3 volunteers were dressed similarly. Lenny Murphy, Basher Bates, Michael Hegan and myself made it to the hospital compound..about half a mile away. Again the place was deserted—eerily so and once more we gained easy access as the padlocks on the gates had been smashed. Once in the hospital itself we quickly found the ward. There crouched on a bed with a pair of striped pyjamas and a house coat was Buster Wade-a UVF detainee. We told him who we were although he neither knew us or us him. He indicated to us that there was another prisoner—he was hiding down the side of an adjacent bed. He was an Official IRA man and was frightened that the Provies might harm him. I remember his first name—Jimmy—but cannot recall his second although my belief is that he had been in for quite a while after being arrested for a cache of guns found during the Falls curfew of 1970. After assuring him he would be okay we escorted both prisoners back to 14. Both had carrier bags with some personal belongings and we gathered as much stuff up as possible in pillow slips and carried those. Tablets—bandages—plasters—methylated spirits –really anything we thought could be of use in case there were casualties later. Once back in 14 both men were found a spare bed. They had a cup of tea and a guard was placed on the cubicle Jimmy was assigned. I don’t recall the reasoning but sometime after this a decision was made for all of the UVF/RHC prisoners who had arrived in 14 should now decamp and make their way to 19. We made an attempt to form up in three’s and in a haphazard fashion we made our way to “Headquarters” No fuss was made of us when we arrived—what I do remember on that walk from 14 to 19 was again more watch towers exploding—being completely surrounded by armed republicans and the constant noise. As best we could a head count for our organisation was conducted and we were able to ascertain our strength in numbers. This was done in the canteen and Gusty gave out whatever instructions were needed. First and foremost we were to be alert-both from Republicans and latterly from the Army. By this stage it was accepted that there was only going to be one outcome. That, in time the Army would retake the jail. And the thinking was that they weren’t going to be polite about things and ask if we were republicans or Loyalists. Other than be on standby there wasn’t a hell of a lot more we could have done. In a year-1974- when “Get Your Boots On “ became a catchphrase, we were well and truly “Laced up” this time. As time ticked by the tension increased. We stood about in groups. All that year we had had many practice drills and we each knew what was expected off us. As in the compound switch between 11 and 12 in July we knew who would be in the front ranks..who would have special duties to perform around the flanks—but in all honesty we always hoped that they were precautions only and hoped they were never realised. Every so often the officers convened—usually to the canteen or half hut for another briefing. And after each meeting we searched for answers—for clues. But the reality was the officers and NCO’s knew little more than we did. In a compound that was custom made to hold a maximum of 80 prisoners there must have been more than 200 in 19 at that stage. We stood about in small groups..we circled the wire—in pairs—in groups… The boilers worked overtime giving an endless supply of tea and coffee. Cigarettes glowed like fireflies around the compound. There was an apocalyptic feel to it all. No one was certain what was to transpire which made it all the more worrying. I suppose if we had thought about it seriously we could have worked out that the Army always attack at a time just approaching dawn..Isn’t that the way it was in all those old TV movies we knew so well? And so..sometime in the very early morning the attack began. Is it my imagination or did it go eerily quiet for a while before the first assault? And then………….a tumultuous roar….battle cries..the warnings..the fear..the adrenaline let loose. They knew it was coming and to a certain extent were prepared..but actuality is a different ball game. The Republicans tactics seemed to be..we will fight them on the wide open expanses of the 2 football pitches…. The scene—if you picture it would look like some latter day battlefield. Opposing forces at each end..advancing to a bloody skirmish..on the half way line. But no. As we stood..our own divorced masses..hoping the battle kept its distance..we could hear all..but see nothing. Like an outdoor cinema with plenty of sound but missing the picture. The noise was frightening…roars of encouragement—cries of despair..warnings shouted..defiance..and of pain. Another noise. That of helicopters..whump-whump-whump—flying low..barely above the wire. And this was before the anti-copter wires were installed. We at last..from our disadvantaged viewpoint—we could see something. Cluster bombs being fires from the helicopters on to the hordes below. CS gas we told one another. Seemingly not we would find out later. The Republicans had no answer..they were dispersed to the four corners..they choked on fumes..they spluttered and they could not see. They fought but in the end they were easy pickings for the ground forces who picked them off. 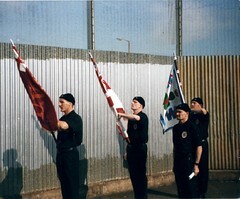 A number of UDA men from 19 had been given the freedom to leave the compound-by jimmy Craig. A few of them..dressed similarly in ponchos and with faces blackened arrived back on a number of occasions carrying wounded Provisional’s-some in worse shape than others. Many had what looked like rubber bullet wounds and I seen a couple who were in very poor condition. They were taken to the back end of the half hut and given whatever treatment was available. The battle continued—for how long I don’t know. But at sometime in the morning—it was daylight anyway on a grey and grim mid morning-activity ceased. By this stage most of the Provisional prisoners had returned to their compounds-which of course by now had been razed to the ground. The game was up. The fight was knocked out of them. If burning the jail was seen as some sort of victory for them towards the end of a year of endless protests, then this night’s bout was indisputably a rout of the highest order. In many ways it was pitiful to see the stragglers trudge back to their cages..beaten and bowed. But the overwhelming feelings amongst most of the Loyalist prisoners were definitely lacking in sympathy. The deceitfulness of the Republican leadership to get us to vacate our compounds wouldn’t be forgotten…and rightly so. During the day that followed we were subjected to countless head counts. To establish who we were—where we had came from. If the Army knew by now that were non aggressors in the previous night’s actions, at times they didn’t show it. They came in with the attitude that everyone was the same and we would be treated as such. In the days and weeks to come we would suffer many hardships—in overcrowded-under heated-filthy and damp and dirty conditions. That story is for another day. The Fire was a turning point in Long Kesh history..but it was far from a glorious chapter in the Provisional’s book of historical fables. This entry was posted in History, prison life. Bookmark the permalink. Thank you Beano for restoring my sanity, this is a much more accurate account of what actually happened that night, especially with regard to compound 11. I was convinced that I was going senile last night as I read the account of the fire, as depicted in wee Plum Smiths new book. You are of course perfectly correct, it was John Mckeague and not big Jim Irvine who was in fact the Commander of Compound 11. At this time John McKeague was also the camp second in command of all UVF/RHC, Volunteers in Long Kesh, and it was in fact John McKeague who overseen the successful evacuation of compounds 11 and 12. Personally for me the most reassuring confirmation of your article, was the confirmation of the fact that it was the UDA, and not us who treated injured IRA men. Wee Plum in his chapter on escapes amazingly seems to have forgotten, that it was in fact two Red Hand Commandos who made the first successful even though unfortunately brief, actual escape from Long Kesh. 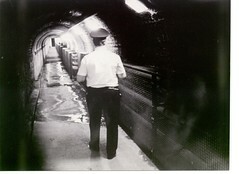 Plum refers to our lack of success with tunnels, with out disclosing the fact that Gusty had came to an agreement with the Governor of Long Kesh, ( against the wishes of the volunteers and command staff of compound 18,) that there would be no tunnels dug in UVF/RHC, compounds in exchange for a less severe system of random compound searches. It also seems strange that Plum neglects to mention the fact that, the first political prisoner, Loyalist or republican, to refuse to accept parole ( on three separate occasions) was a Red Hand Commando from compound 18. Without a doubt the most alarming aspect of wee Plums faulty memory is the fact that, while most of his new found friends from, the IRA and the parasitic press were personally invited and present at his new book launch, he neglected to invite the vast majority of his ex-comrades, who thankfully have not sold out to the new popularity seeking, poor me, sorry I ever heard of God and Ulster brand of, Ideologically born again Loyalism, which wee Plums book aspires to. THE GRINNING TOOTHLESS HATCHET MAN WITH THE ARMOUR PLATED BACK. I am sick sore and tired of seeing my old friend and Comrade Davy Ervine ,being portrayed by the parasitic media, and now, the poor me, sorry I ever heard of God, sorry I ever heard of Ulster, ideologically born again Loyalist brigade, as a big cuddly pacifist, teddy bear. Wee Plum Smith in his new book, “INSIDE MAN”, is the latest culprit. Plum gives the false impression that, he knew Davy very well in Long Kesh. 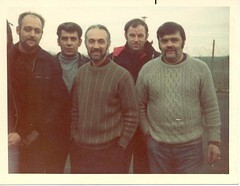 Unknowledgeable readers of Plums book are given the false impression, that Davy Ervine upon entry into Long Kesh in 1975, entered into the same Compound as Plum and Gusty, IE; Compound 21. This is of course totally untrue, Davy in fact entered Long Kesh in mid 1975, into the recently reconstructed Compound 18. It was under the leadership of Compound 18 Commander, Danny Strutt, that Davy matured into an articulate, 1st Class Ulster Volunteer. Davy in true Compound 18 fashion, became a defiant, “NO STATEMENTS, NO REGRETS, NO SURRENDER” Volunteer. Due to this fact and his loyal reliability, Davy was eventually promoted to sergeant by Danny Strutt. 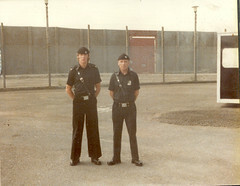 Davy Ervine was still a sergeant in Compound 18, when I was released at end of March 1977. 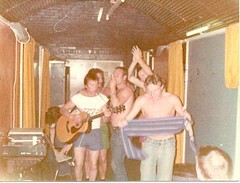 Wee Plum was released A few months after me, in mid 1977, at this time Davy Ervine was I believe, still in Compound 18. YES, Davy did eventually enter the less regimentally disciplined, Compound 21 and YES, Davy does appear to have been converted to, ”Ideologically Born Again Loyalism” within the cramped, intoxicatingly pipe smoke filled, cubicles of Compound 21. I believe that “imagination” and not “imaginative, is the true word that Plum should have been using and if Davy did indeed return as enthusiastic as ever for the next meeting, then Davy must have been one hell of a World Champion long jumper, because the two compounds were at least 300 yards apart, and Gusty was the only one with freedom to visit other compounds. In fact I sincerely believe that, the only times that Plum, would ever have came into contact with Davy Ervine, would have been when Plum was being flattened by Compound eighteens grinning toothless, hatchet man half back, with the armour plated back, during the inter compound football matches. Davy had lost a lot of his teeth due to a massive gum abcess, which was left untreated by the prison medical staff, until it was too late. Also due to a very severe accidental scalding as a child, Davys entire back was one large mass of thick armour plated, hard rubbery, rutted skin, which Davy used to full advantage when bouncing opposing forwards over the bye ball line. In short, Davy was no tree hugging pacifist, nor was he a supporter of the meaningless, uselessly obsolete, Irish Language during his service as an Ulster Volunteer in Compound 18. Beano Niblock is perfectly correct in his assertion, that we the survivors of the seventies who took up arms, in defence of the democratic right of the people of Northern Ireland to decide their own future, must get together before it is too late, to TRUTHFULLY, AGREEABLY and ACCOUNTABLY record the true story of our Fallen Comrades sacrifice, at a time when the only possible reward for Loyalty was, either imprisonment or death. 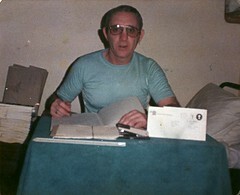 CHARLIE FREEL, ex-RSM, of all UVF and RHC Compounds and Second in Command of Compound 18.